VICTORIA – The University of Victoria Vikes men's and women's swimming teams added three more medals to their tally on Day 2 of the Canada West Swimming Championships hosted in Calgary, Alta. 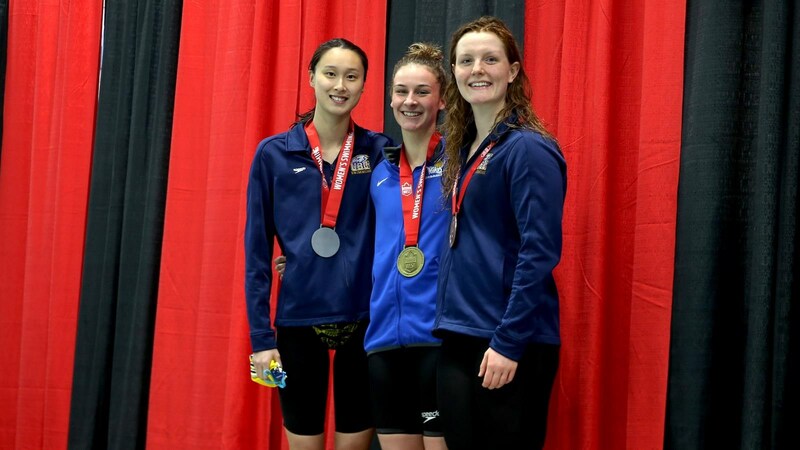 Danielle Hanus added her second individual gold medal of the championship after she broke the conference record and topped the podium in the 100-m butterfly. With 645 points, the UBC women's team holds a 243-point lead ahead of Calgary (402), while the Thunderbird men (514 pts.) hold a 74-point lead ahead the Dinos (440) heading into Sunday's final day of competition. "Overall pretty good today with Danielle breaking a record and having a really good swim in the 100 fly," said Vikes head coach Peter Vizsolyi. "Our relays were really good today, too. Even though our men didn't medal they did well and our women's relay had a really good race." Hanus was the first non-Thunderbird woman to capture a gold medal of the night and the second to break a Canada West record. Hanus swam a time of 58.89 in the 100-metre butterfly, lowering her own record set a year ago in the Vikes' home pool. Vike Allison Ballantyne raced to a personal best in the same event finishing 10th in 1:04.36. On the men's side, Calgary's Robert Hill caught up to Markus Thormeyer of UBC during the breaststroke of the 400-metre individual medley race and the two were side by side going into the finish, but it was Thormeyer who pulled ahead and took gold with a time of 4:16.46. Hill took silver with 4:18.06 and Josh Zakala from Victoria took bronze finishing with 4:22.11. Three Vikes qualified for the A Final in the men's 100-m butterfly. Ethan Jensen was the top Vike finishing in 55.20 to qualify for the U SPORTS National Championship and to finish fourth in the conference. Team mates Daniel Greer finished fifth (55.41) and Padric McKervill was seventh (56.33). "I think having three of our guys in the A Final of the 100 fly was really, really good and definitely a highlight today," said Vizsolyi. "Most of them are in first and second year and Ethan just missed the qualification before and now, he has it so that was so great." Taylor Snowden-Richardson raced the A Final in the women's 200-m backstroke and finished seventh in 2:22.81. In the men's race Zakala finished sixth to qualify for U SPORTS nationals with a time of 2:02.42. Also in the men's 200-m backstroke, Buzz Mallender finished in 2:04.64 for 13th and Eric Hedlin was 2:05.15 for 15th place. In the women's 200-m breaststroke first-year Vike Jamie Hellard finished eighth in 1:12.23, while Kara Wilson topped the B Final in 1:13.08. Andrea Farmer finished 12th overall in 1:13.58. The Vikes had two swimmers in the men's 100-m breaststroke as Bailey Espersen qualified for nationals in 1:03.00 and Canada West fifth place. Greer was 1:03.58 and seventh. In the B Final, Arthur Firmino was 12th in 1:05.78 while Thomas Van Maren was 13th in 1:06.21. "Bailey didn't have a good swim this morning in the prelims and then he was able to make some adjustments and swim what he needed tonight," added Vizsolyi on Espersen's qualification. The Vikes women of Hanus, Lauren Taylor, Ballantyne and Kaitlin Gervais swam to a bronze in the 4x100-m freestyle relay. The Vikes qualified for nationals in a time of 3:48.72 behind UBC (3:42.47) and Calgary (3:48.51). The men's relay finished just off the podium with Buzz Mallender, Espersen, Hedlin and Zakala finishing in 3:24.99 for fourth.